Gov’t Hot Air Responsible for Higher Gov’t Temps? Using the new Leroy 39 (2010) classification system on the older siting metadata used by Fall et al. (2011), 40 Menne et al. (2010), and Muller et al. (2012), yields dramatically different results. 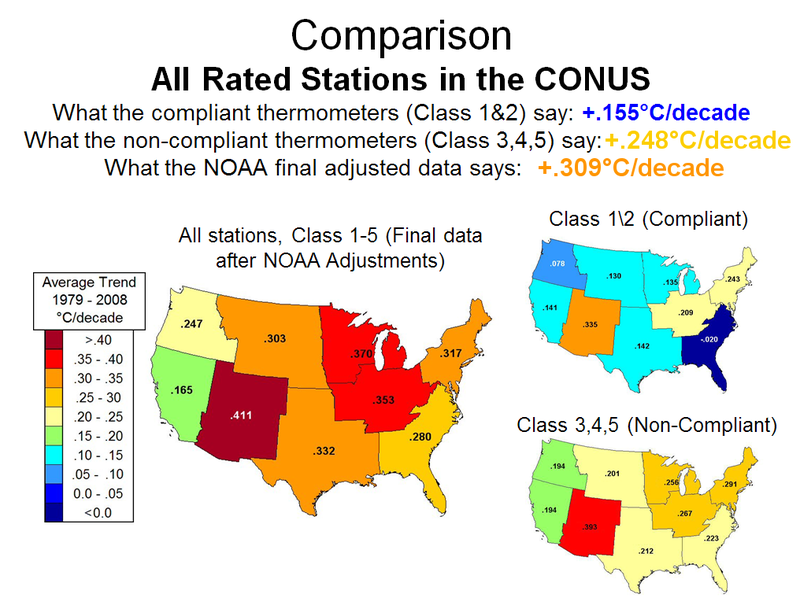 A reanalysis of U.S. surface station temperatures has been performed using the recently WMO-approved Siting Classification System devised by METEO-France’s Michel Leroy. The new siting classification more accurately characterizes the quality of the location in terms of monitoring long-term spatially representative surface temperature trends. Using the new Leroy 39 (2010) classification system on the older siting metadata used by Fall et al. (2011), 40 Menne et al. (2010), and Muller et al. (2012), yields dramatically different results.The paper is the first to use the updated siting system which addresses USHCN siting issues and data adjustments. The new improved assessment, for the years 1979 to 2008, yields a trend of +0.155C per decade from the high quality sites, a +0.248 C per decade trend for poorly sited locations, and a trend of +0.309 C per decade after NOAA adjusts the data. This issue of station siting quality is expected to be an issue with respect to the monitoring of land surface temperature throughout the Global Historical Climate Network and in the BEST network. Today, a new paper has been released that is the culmination of knowledge gleaned from five years of work by Anthony Watts and the many volunteers and contributors to the SurfaceStations project started in 2007. 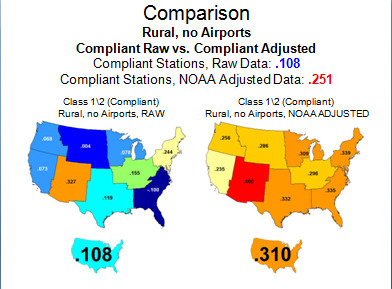 This pre-publication draft paper, titled An area and distance weighted analysis of the impacts of station exposure on the U.S. Historical Climatology Network temperatures and temperature trends, is co-authored by Anthony Watts of California, Evan Jones of New York, Stephen McIntyre of Toronto, Canada, and Dr. John R. Christy from the Department of Atmospheric Science, University of Alabama, Huntsville, is to be submitted for publication. I know that is prior to acceptance, but in the tradition that I grew up in (under Nobel Laureate Luis Alvarez) we always widely distributed “preprints” of papers prior to their publication or even submission. That guaranteed a much wider peer review than we obtained from mere referees.